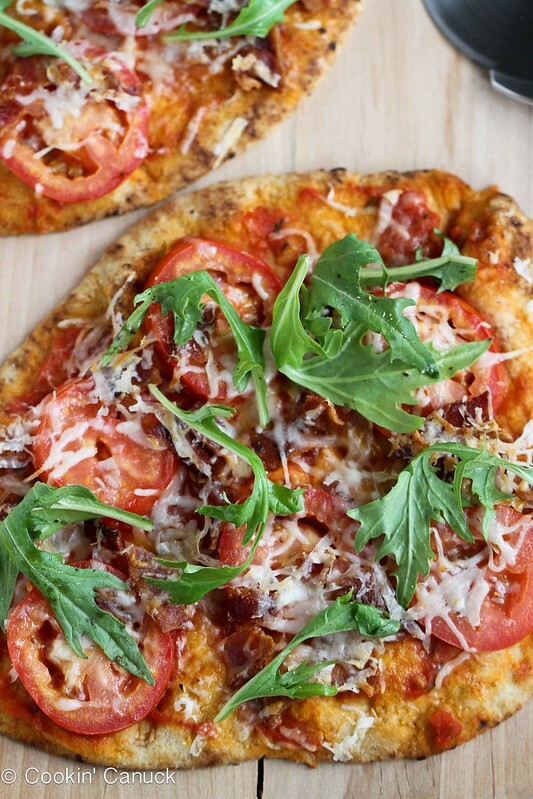 This BLT Naan Pizza with Bacon, Arugula & Tomato is an easy and healthy lunch or dinner idea. Last week, I told you about the surprise that my husband, Steve, and I planned for our youngest son’s (T) ninth birthday. As soon as he headed off to school, we started on some heavy lifting. Two hours and many sore muscles later, the transformation was complete. My little boy had his own room for the first time, and we were absolutely itching to see his reaction when he got home from school. As soon as T walked through the door and dropped his backpack to the floor, we asked him to cover his eyes. Our older son, M, could barely contain his excitement because he was in on the surprise – and was rather happy to be getting his own room out of the deal. We spun him around a couple of times (the ol’ “confuse ’em by making ’em dizzy” trick) and guided him up the stairs. When T was standing in front of his new door, adorned with “Happy Birthday” balloons, we asked him to open his eyes. As much as it makes our hearts ache to see the boys grow up, we rejoice with them as they experience life’s twists and turns. Having one’s own room can be a rite of passage, and it is another step towards the independence that we are teaching our boys to embrace. 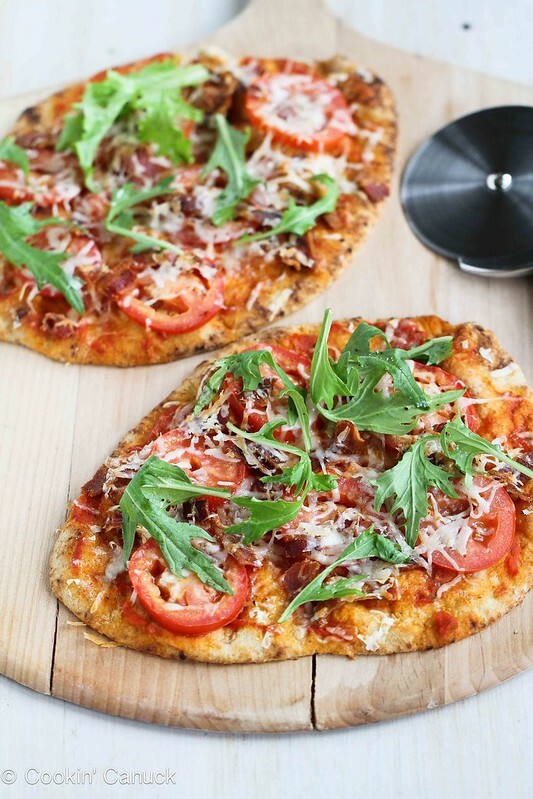 This pizza takes all of the elements of a classic BLT sandwich and piles them on top of whole wheat store-bought naan bread. Within minutes, you can go from, “What the heck are we going to have for dinner?” to a meal that is both satisfying and healthy. Preheat the oven to 425 degrees F. If using a pizza stone, heat the stone in the preheated oven for about 10 minutes. Lay 2 pieces of naan on a pizza peel or on a baking sheet (if you’re not using a pizza stone). Spread 2 tablespoons of tomato on each piece of naan. 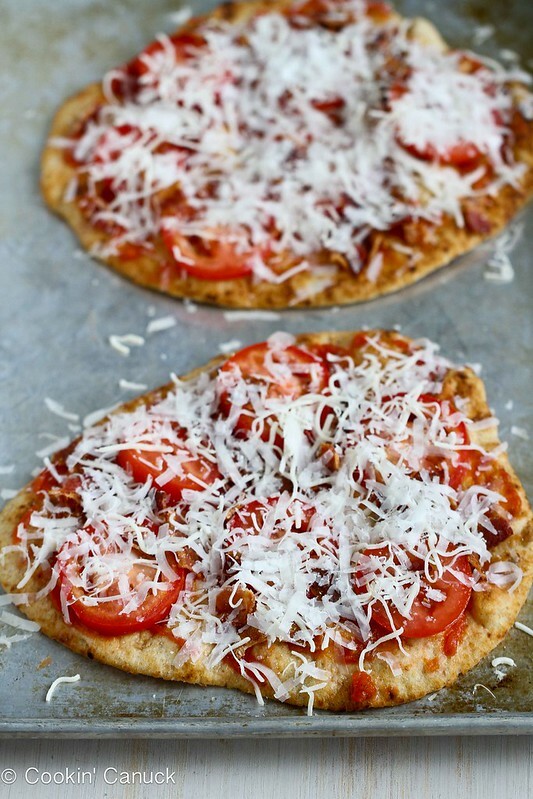 Divide the bacon, tomato circles, mozzarella cheese and Parmesan cheese evenly between the 2 pieces of naan. If using a baking stone, transfer the pizzas from the peel to the stone. If using a baking sheet, place the baking sheet in the oven. Bake until the cheese is melted and the naan bread is golden brown, 7 to 8 minutes. 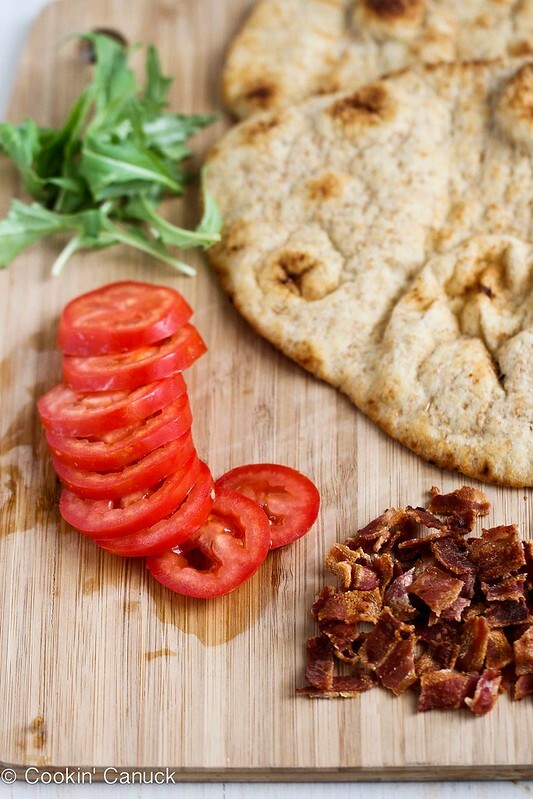 Transfer each BLT naan pizza to a cutting board and let rest for 5 minutes before slicing. 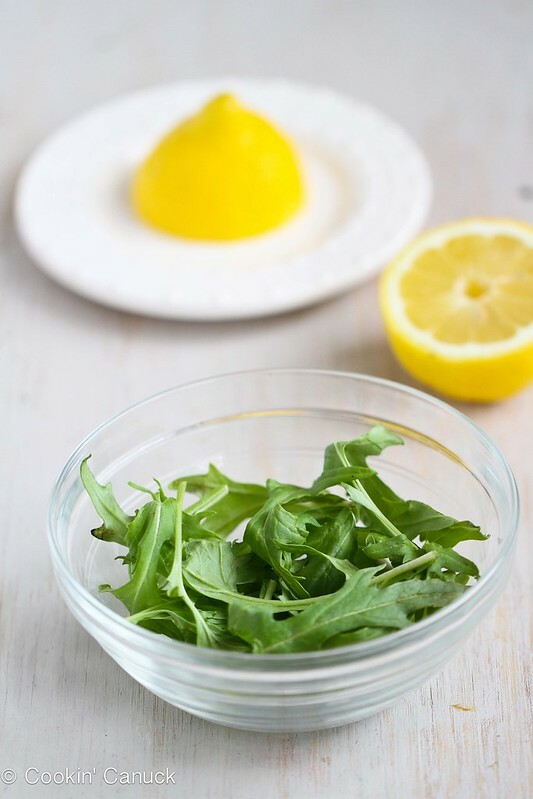 While the pizza is resting, place the arugula in a small bowl and toss it with the lemon juice and ground pepper. Top each pizza with half of the arugula. Slice the pizzas into quarters. Serve. Lay 2 pieces of naan on a pizza peel or on a baking sheet (if you're not using a pizza stone). Transfer the pizzas to a cutting board and let rest for 5 minutes before slicing. What a gorgeous pizza!! Love the idea of naan crust!! Thanks, Liz. I love the ease of the naan bread. I always have naan in the freezer, and almost always use it for pizza. Love this quick and easy version. It really is a great ingredient to have on hand. So cute! I bet the was such an awesome day for all you guys! Love this pizza!! So fresh and summery! Thanks, Tieghan. He was pretty thrilled with his birthday surprise! Thanks, Rachel. Yes, my older son was practically bursting with excitement, but did a very good job of keeping the secret. I still remember when my parents did that for me! I was so excited to have a redone room. This pizza. Well. I’m ALL about pizza 24/7! Thanks, Dorothy! My parents re-did my room for me when I was a kid, too, and I’ll always remember that surprise. This naan pizza thing is intriguing me, I can’t wait to try! Thanks, Abby. It’s a great ingredient to have on hand for quick meals. I love using naan for pizza crust! I am so glad he liked his surprise! So fun! Thanks, Maria. He was a very happy boy! You don’t eeeeeven have to twist my arm. Thanks, Bev. I feel the same way about pizza. I should make more naan pizzas, this looks so good, and your son is such a cutie! Cutest story ever 🙂 Love your pizza too! Thanks, Lori! It was a fun day for all of us. 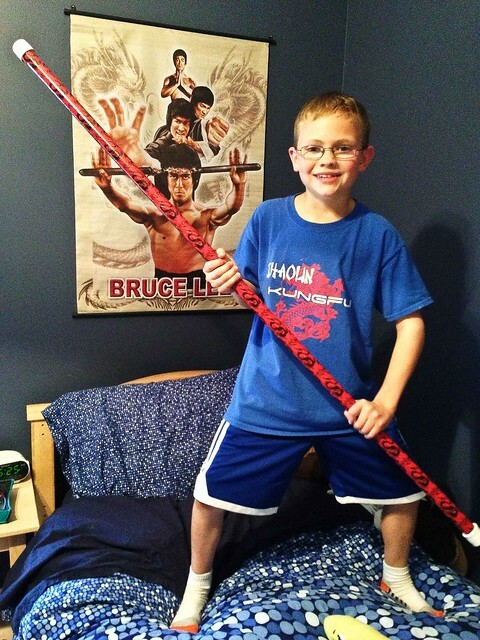 Well, I do love the pizza idea, but the pics of your son’s obvious excitement of moving into his own “big-boy” room are just priceless! Thanks, Kimberly! He was absolutely beside himself with excitement. He couldn’t wait to show his new room to his friends. Thank you, Claire. It’s definitely going to become a regular item on our dinner menu. I remember loving when my parents would let me redo my room. Love this pizza. Thanks, Meaghan. Yes, I remember it as a such a wonderful feeling of independence. Those pizzas look so good! I love that you can make an individual pizza how ever you want, and that it’s pretty low-cal. I remember the first time I had a room to myself. So special! Thanks, Crystal. I decided not to overdo it on the cheese on the pizza because the rest of the ingredients had plenty of flavor. That definitely helped to keep this healthy. I love naan pizzas, yum! Thanks, Laura. I feel the same way. So cute! 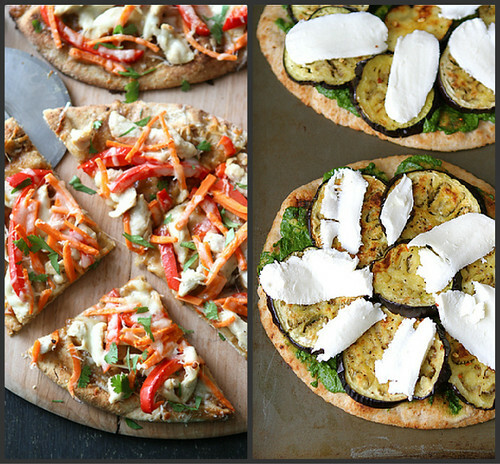 I love naan (specially homemade), and these look fantastic! Thanks, Nessa. Someday I will learn to make my own naan! Our kids grow up so fast don’t they. My own will be getting married soon:D So don’t blink:D As for the pizza I like the ease of using naan. I know that day will be here before I know it, but I can’t think about that yet. I can’t barely think of my older son starting middle school! I love that you used the words bacon and healthy to describe this pizza. Poor bacon has a bad rap…it IS all about moderation! Naan is genius; I will use a store bought pizza dough but this is even easier. Love it. So true, Barb! Everything in moderation. You guys are the best parental units!! And this naan pizza, amazing!! What a great birthday present for your son! Absolutely love the flavors of this pizza! 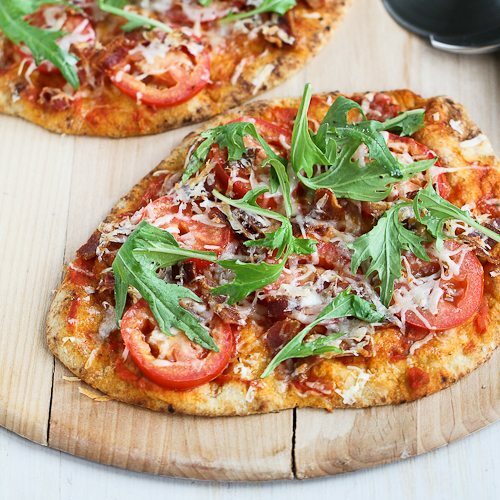 We’ve been trying different naan pizzas lately, this one needs to get added to the list! Thanks, Jessica. Naan pizzas are awfully addictive, aren’t they? Great looking pizza, Dara! I love those quick easy delicious meals 🙂 Great for weeknights! Thank you, Addie. I do love the ease of naan bread. I love arugula on pizza! What a sweet picture. I can only imagine how thrilled they both are to have their own rooms. You and Steve are such awesome parents- I really look to you guys for role models! The pizza doesn’t look half bad either 🙂 You know I love my bacon! Aww, he looks so happy in his new room! What a fun surprise. I love these pizzas, Dara. Naan pizza is a great idea! Yum! This looks right up my alley. I pretty much always have BLT stuffs on hand, going to pick up some naan asap! I love this – especially how easy it is with the Naan!! Happy birthday to your little dude!! How great! And I would totally celebrate with these pizzas, too. YUMOH! Oh yum! Totally dreaming of this right now. 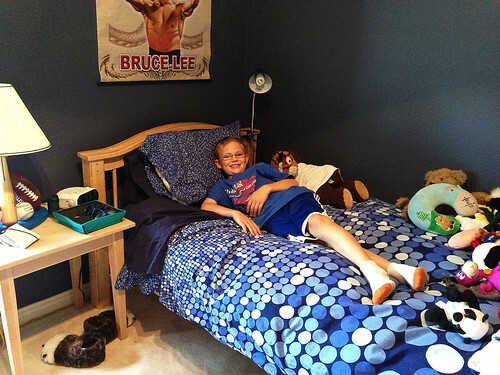 Your son looks just delighted with his new room–what a wonderful birthday surprise. This pizza looks delicious–I’m chomping at the bit for the CSA farm share to get started so I can some fresh greens on my pizza. In my pizza I’m good with, but it’s time to branch out. Oh my gosh, your little guy is adorable and really, what a fun surprise gift!! Love that!! You know I love this, naan pizza is one of my favorites. The toppings on this are absolutely fantastic!! This pizza looks wonderful, great flavors! I really have to make this recipe, thanks for sharing, that looks yummy and something my family would love to eat. I love naan, this is genious!